Hawai'i 13 symbolizes a band reaching their prime, and the result is an insanely catchy, yet deep and thought provoking album. With the help of Danny Kalb (Ben Harper, Cas Haley, Beck) behind the mixing board, the band sounds more tight and polished then ever, in the best way possible. The raw emotion and beautiful vocal meoldies all shine through the mix with each instrument and voice finding their space. Even during the most energetic moments of Hawaii '13, the mix never seems overwhelming; not for a single second does any subtlety or nuance get drowned out. The Hawai'i 13 title is a reference to both the albums release year and the number of songs (13 songs wrapped between intro and outro tracks). From the very first track, this album takes you on your own personal trip to Hawaii with native a'capella chanting. As the chanting fades out, "Even Before" begins and slowly serenades the listener with its mellow verses and dub-friendly solo section. "Good One" hooks the listener with an interesting intro accompanied by a horn section while the vocals progressively steal the show. Next up is the previously released "Something About It", one of the highlights of the album. The heavy dose of rock-iunfluenced reggae and constant changing of vocalists really showcases the versatility of the band. "Power of Words", one of my personal favorites. The song starts off with simple guitar strumming and is quickly joined by toms and a piano before turning into its bouncy reggae form. The beautiful tone of the piano takes this song to another level when combined with the the lyrical preaching of positivity. "Good Vibe Killah" is yet another personal favorite. The thought-provoking lyrics of the song as well as the melody, and backing harmonies, of the bridge make this track stand out. "Chocolates & Roses" again showcases a piano with a beautiful tone as well as bringing back the romantic mood-setting vibe The Green has become famous for. The mood continues in a bit of a more dubbed-out fashion with "Hold Me Tight" followed by a pick-me-up high-energy "Striking Up A Love". "Take Me On", the first single released from Hawai'i 13 shines just as bright as when it was first released and is placed perfectly in the tracklist.The way vocal and brass melodies mix in this song is truly a thing of musical beauty and can be enjoyed by audiences of all ages. "Forgive Me" brings a darker, more serious mood to the album as the bassline punches the song along. "Count to 3" demands attention from its opening guitar riff. The song builds up and down repeatedly with the help of beautiful vocal hooks. "Stand & Rise" starts with what sounds to me like a melodica and is carried along with exciting drum fills and sounds of a rotary organ. "Always & Forever is a perfectly happy and upbeat pure reggae song that would make The Wailers want proud. Following the good vibes of "Stand & Rise" comes a closing chant titled "Hawai'i Aloha" that gave me goosebumps of joy following the musical journey that Hawai'i 13 takes the listner through. 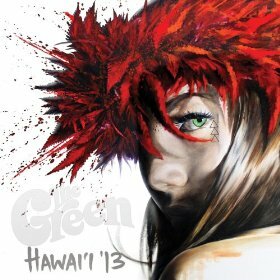 Overall Hawai'i 13 is an incredible album the will more than likely go down as a major milestone in The Green's career. The Green bring back everything fans have grown accustomed to from their previous albums while still bringing a brand new feeling to their album. Hawai'i 13 shows an incredible amount of growth in band chemistry and production, bringing The Green to the top of any reggae fan's radar. The mixing of melodies and harmonies combined with beautiful instrumental tones makes for one of the most well-polished reggae albums of the year. While many bands who specialize in a more laid back style of reggae risk becoming boring, The Green's Hawai'i 13, by periodically changing instrumentation and masterfully transitioning between song parts, never once comes close to touching that borderline.